Inside this book are dozens of sinister beings waiting to strike terror into the hearts of role-players everywhere. From the dreaded scarab beetles of Har'Akir to the archer skeletons of darkon and the drow vampires of Arak, these Creatures of Darkness will provide hours of diabolical adventure. But be warned - if you buy this accessory, your AD&D game players may never forgive you. 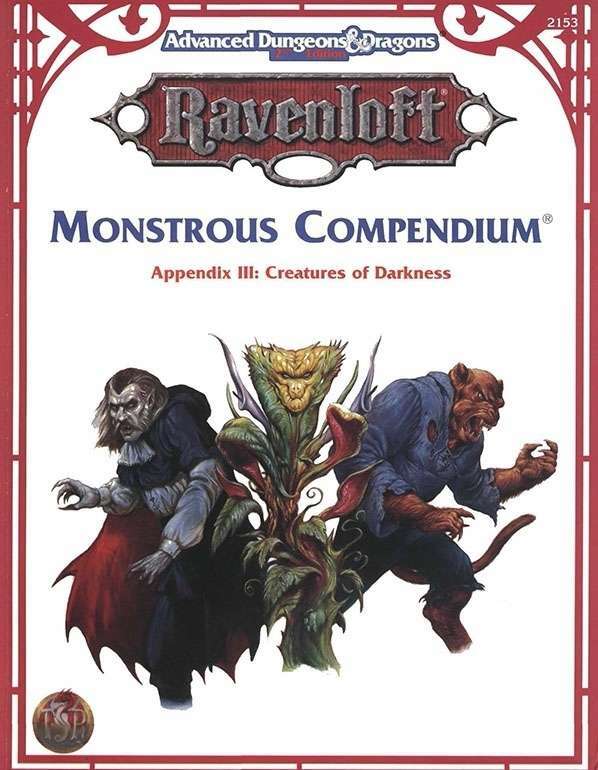 The Ravenloft Monstrous Compendium III: Creatures of Darkness (1994) was written and designed by a collection of freelance authors including Kirk Botulla, Shane Hensley, Nicky Rea, and Teeuwynn Woodruff. Another six designers filled in monsters as well, and the 128-page compendium was edited by William W. Connors. Connors had written the first two Ravenloft Monstrous Compendium appendices, and he admits in the introduction to having particularly high standards for the work, a fact that is evident in the final product. The monsters included are a mix of wholly original foes and monsters adapted from published Ravenloft modules. Well, I Didn't Expect THAT. One of the things that Ravenloft traditionally does well is taking the known and twisting it in a particularly terrifying or unexpected way. Rubbery boneless corpses go a long way towards making zombies interesting again, for instance. The boowray gives a GM the fantastic excuse to whisper awful advice in the ear of a player. The carrion stalker turns your game session into Alien, undead familiars seek to teach a lesson to the wizard who let them die, and crawling ivy is a simple plant that can terrify anyone trying to enter a house that it covers. Not every creature is inspired (I'm not sure I'll ever use the akikage, which is effectively a duty-obsessed ninja ghost), but a drow drider lich leading a small army of insectoid undead is bound to be memorable. Variations on a Theme. This compendium has several groups of monsters that riff off of a basic type: There are three types of "animators," three types of cloaker, five types of figurine, four golems, four liches, five lycanthropes, six viruses, four will o'wisps, and five zombies. This is not a bad thing; despite starting with a known quantity (or in the case of viruses and figurines, creating a new category), some of these monsters are brilliant. "Zombie fogs" are practically a staple of horror movies, and back when this supplement first came out, I built an entire campaign arc around the viruses. Still, there are a few clunkers - I'm pretty sure that other lycanthropes sit around and mock the wereray, for instance - but the variations in design produce frightening, effective monsters. Animators can make simple objects come to life, for instance, but you're going to get the attention of your players when the entire ship they're on turns out to be possessed by a greater animator. It's easy to build an entire adventure around this. Overall, this collection of over 120 statted monsters is worth your attention if you're playing AD&D or want some ideas for horror-based villains. There's innovative and fun design in here, along with some creatures your players probably won't expect. Moving them out of Ravenloft and into a non-Ravenloft campaign is simple, and this appendix makes a nice supplement to the core monsters of AD&D. About the Creators. This was the only TSR game supplement written by freelancer Kirk Botulla. 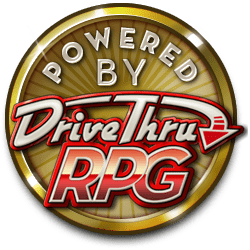 Shane Hensley is an author, game designer, and CEO of Pinnacle Entertainment Group, publishers of Deadlands and Savage Worlds; he was a lead at Cryptic Studios on their award-winning City of Heroes and City of Villains MMORPGs. Nicky Rea is an author and game designer who has written a slew of material for TSR, White Wolf, Fading Suns, and other publishers. Teeuwynn Woodruff is an experienced game designer with credits including Wizards of the Coast's Magic: the Gathering, Pokémon, and Duelmasters, along with a number of products for White Wolf's Vampire: the Masquerade, Werewolf: the Apocalypse, and Mage: the Ascension games. She is currently creative director at Lone Shark Games.